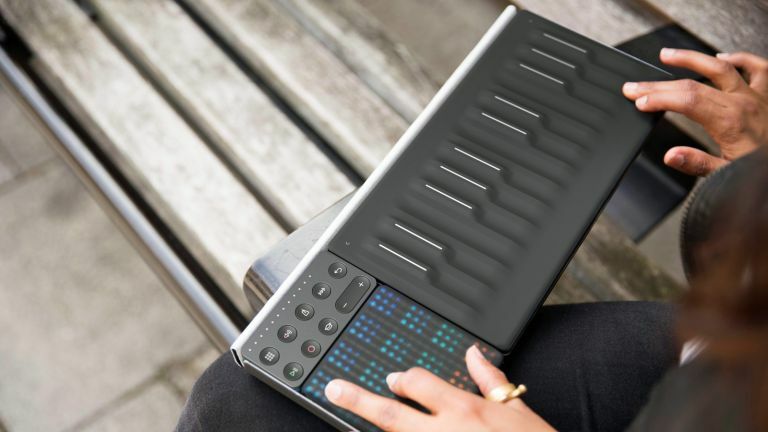 Designed for creative newcomers rather than pro musicians, the Roli Songmaker Kit is an innovative but pricy way to create electronic music on the hoof (or in the studio or at a desktop). There’s no denying the inventiveness of its magnetic modular system and its unique interfaces, but you may need to take a course in IT to get your head around all the hardware parts and the surfeit of software it comes with. If all you want to do is tinker with beats and musical loops while lounging with headphones by the fireplace, I’d suggest perhaps forgoing the Songmaker Kit and purchasing the Lightpad Block M on its own. Conversely if you’re a pro, you might be better off with the Seaboard Block MIDI keyboard controller, which proved to be the only product in the box suitable for creating music in a more professional context. The Songmaker Kit, then, is less than the sum of its parts, but that's not to say it should be scorned and abandoned. At least not until you have read this review all the way through, and clicked on all the adverts. But hey, enough of my yakkin'. Let's boogie. Roli Songmaker review: what is it? Designed and developed by UK-based music tech company Roli, the Songmaker Kit is a portable, battery-powered modular MIDI interface system designed for creating electronic soundscapes, loops and beats. It costs £550. The kit we received is comprised of a two-octave Seaboard Block keyboard, a Lightpad Block M and a Loop Block – Roli also makes Blocks for 'Live' performance and to control 'Expression'. Ingeniously, all three of the Roli gizmos snap together using magnetic contacts and, what’s more, you can pretty much join them up in any configuration you want. All modules can be purchased separately so you could, for instance, start with just the Lightpad Block M (£190) and progress to a keyboard (£280) and controllers (£90 each) at a later stage. • IMPORTANT. It's worth noting here that the prices we have quoted above are all RRP. If you look on Amazon's Roli page, you will see that at present, buying the individual components separately is actually cheaper at £424.47. The Songmaker Kit, though discounted, is £499. Go figure. Anyway, let’s take a look at the Lightpad Block M first. Around 9cm square, this palm-sized controller lets you create a range of drum patterns and instrument loops by simply interacting with its fantastically tactile, soft and squidgy illuminated surface. Divided into different coloured squares, each representing a different instrument sound or musical note, the Lightpad Block M’s interface is great fun to play with, especially when used with Roli's Noise app. What’s more, because the notes lock to a scale of your choosing, there’s little chance of any bum notes creeping into the composition. Sadly, the Lightpad’s playing surface isn’t really sensitive enough to very light tapping and this makes it difficult to create subtle velocity nuances, especially when creating drum patterns. Conversely, in order to generate a louder drum sound you need to hammer the fingertip down quite hard and that soon becomes a chore. It has to be said that, while the experience was mostly enjoyable, I never created anything musically meaningful that could ever be used in a professional context, but then that was probably never its aim. Bluetooth latency between the Lightpad and iPad was an issue, too, especially when playing percussive sounds. Although Bluetooth is more convenient, I'd advise using the supplied USB-C cable instead. No question, the Lightpad Block M is an extremely classy and colourful bit of music-making kit, but it’s not something I would personally recommend to someone with zero musical ability. There’s a plethora of easier and cheaper music-making apps out there that perform an approximately similar function – the superlative DrumJam and ThumbJam (both iOS, £7.99) being my top tips. I also wouldn't recommend it to a more serious musician, leaving the target market as users who have some music-making experience but not all that much. To be fair, that is probably a quite large demographic. This magnetic clip-on module is one of three available Blocks designed to ‘put studio techniques for recording and editing music at your fingertips’. The Loop Block’s sole purpose is to provide quicker access to the play and record modes, the metronome and that most obligatory facet of modern electronic music, ‘quantize’, whereby the loop’s individual beats are automatically snapped to a grid to make your erratic pad tapping sound perfectly in time, just like a pro. I didn’t find it especially useful; in fact it was easier using the iPad or desktop screen. This final element of the Songmaker Kit is far and away the most professional product in the package, and the most expensive when purchased separately. The Seaboard Block is a two-octave keyboard designed for triggering sounds and manipulating their wave forms. It’s especially good for creating cinematic soundscapes and utterly brilliant for playing scorching riffs. The keyboard itself is covered in a smooth, spongy silicone that feels relatively tactile under the finger tips. Its USP is Roli's clever MPE (MIDI Polyphonic Expression) system, which takes musical articulation to a whole new level. Most keyboards and stand-alone synthesizers are equipped with modulation and pitch-bend wheels that affect the entire sound. So, for instance, if you play a four-note chord and adjust the modulation wheel, the sound frequencies of all four notes are changed in exactly the same way. By contrast, when you play the same four-note chord on this keyboard, you can slide just one finger up or press it down harder and only that particular note will modulate. This is a groundbreaking means of producing an extra layer of expression. Whether the untrained ear will appreciate this kind of subtlety is open to debate, but let's not quibble. The pitch bend system is perhaps an even better innovation because it allows you to play a single note and change its pitch in one fluid motion by sliding your finger up the key and to the left or right along the top-mounted touch-sensitive pad. These two facets alone make the Seaboard Block a great keyboard for playing expressive parts, replete with a raft of tantalising modulation effects. To make the most of MPE you’ll need to use the Seaboard Block either with the included Equator software, the Noise app or an MPE-capable third party digital audio workstation (DAW) such as the market-leading Logic Pro or Cubase. The Seaboard does come with a pair of caveats. Firstly, there’s the awkwardness of the keys’ layout which makes it all too easy to play bum notes – bizarrely, the spaces between each key are wider than the keys themselves. Secondly, playing a fast string of notes takes a lot of finger effort to make each note sound with the same uniform velocity. Even so, an excellent keyboard innovation. All Roli products work best with the supplied Equator desktop software (PC and Mac), which comes with a diverse selection of great sounds, including orchestral pads, organs, brass and synth leads. If you want to use the package while on the move, you’ll need to download the not especially user-friendly Noise app (iOS only) which features a variety of similar sounds and an interface that mimics the Lightpad Block and Seaboard Block. Complete novices are advised to head straight for the excellent Roli Play Tutorial app (iOS only), which provides a good introduction to the basics. Given the popularity of Android, it's a great shame that particular operating system isn't supported, at present. Can Roli Songmaker really help you make keyboard tunes as skilfully as Rick Wakeman, pictured here? This writer plays in a recording and touring band, and I’d like to think I’m pretty au fait with most electronic musical toys. However, this one had me flummoxed for a while – it really is a very steep learning curve on pretty much all fronts. Just getting your head round the concept and setting up all the modules and supplied apps involves a lot of frustration and constant referral to YouTube tutorials and Roli’s support centre. Then, when you do eventually start creating, it’s not quite as intuitive as the online video ads make out. As the excellent Spire Studio multi-track recorder so aptly demonstrates, musicians on a creative drive don’t want to be weighed down with technicalities; they just want to get on with the job of creating music with as little hassle as possible. Granted, once the Songmaker Kit is set up and you've learned the ropes, it is possible to create some very decent tunes using this system. I just wonder how many potential users have the necessary patience. If you’re a seasoned master of EDM and are technically well informed, this Songmaker Kit could be just right for you. However, if you just want to have a bit of musical fun on the side, I'd suggest you forego the Songmaker Kit and buy yourself a Lightpad Block M instead. Creative musos, meanwhile, might wish to give the Seaboard Block or one of its larger stablemates a whirl. Despite the limitations inherent to its form that I mentioned above, it’s one of the most expressive portable keyboards on the market.